Iron Cactus Mexican Grill & Margarita Bar is celebrating Cinco de Mayo all month long by giving away $10 off coupon to its current and new Facebook fans. 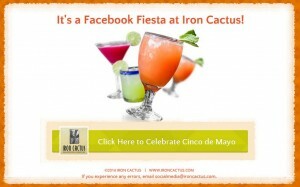 Facebook users can only avail of the special coupon by visiting Iron Cactus’ Official Facebook Page at https://facebook.com/ironcactusfan using Facebook’s desktop version and clicking on the tab labeled, $10 Off Iron Cactus. To receive the $10 off coupon, users must have a Facebook account and follow the simple steps once they click on the $10 Off Iron Cactus tab on Iron Cactus’ official Facebook page. Once users have followed the process, the coupon will be delivered directly to their email address. Guests who want to use the coupon must inform their server that they will be using it. They must show the email or print the coupon with the QR code visible so it can be scanned. The $10 off coupon can only be used once at any of the five Iron Cactus locations in Austin, Dallas and San Antonio. The special Facebook Fiesta coupon is valid for lunch and dinner any day of the week including weekends. However, the coupon is not valid for Happy Hour prices, Sunday Brunch Buffet, alcohol purchase and may not be combined with any other offer. It expires 30 days from the date the Facebook user goes through the steps to receive the coupon. Additional restrictions may apply. If users experience any technical errors from its $10 Off Coupon app, they can email socialmedia@ironcactus.com for support. Iron Cactus serves contemporary Mexican dishes and premium, award-winning handcrafted margaritas. The original restaurant opened on historic 6th Street in downtown Austin in 1996. Since then, Iron Cactus has grown to five locations including restaurants in downtown Dallas, San Antonio River Walk and two additional Austin-area locations in North Austin and Hill Country Galleria. You can find Iron Cactus on Facebook , Twitter, Instagram and Pinterest. More information about Iron Cactus can be found at www.ironcactus.com. In Austin, San Antonio, Dallas, Deals, Social Media Tagged Facebook, Cinco de Mayo, Coupon Bookmark the permalink.